View More In Potholders & Oven Mitts - Page 8. 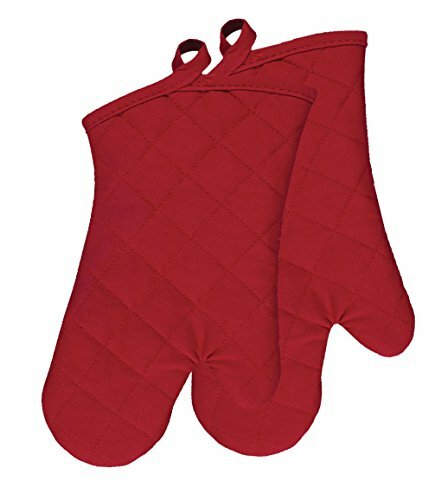 Oven Mitts and Pot Mitts from Chef's Collection by KAF Home will protect your hands when cooking and baking in the kitchen. They are made of high quality 100-percent cotton and come in broad range of colors to complement any kitchen decor. The exterior fabric is a durable cotton twill and the interior is a high pile terry loop with a heavy fill for added protect when working in the kitchen. Each mitt has a loop to hang for easy storage. They are proudly made in the USA at a family owned and operated factory. Easy to care for, machine wash in cold water and dry in a warm dryer; do not bleach, remove from dryer promptly from the dryer. The yarns are color safe and will not fade or bleed but it is best to wash with like colors. As with any natural fiber, you may experience minimal shrinkage.